Liverpool captain Steven Gerrard said his side would come back stronger next season after their 2-1 defeat by AC Milan in the Champions League final. "We can be proud of ourselves. 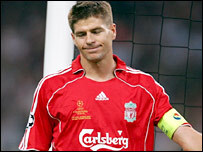 We've done so well getting to the final and I know we'll play in another one of these finals," said Gerrard. "We've got to pick ourselves up, have a good rest in the summer and then go again next season. "We're going places, there's no getting away from that." Two goals from Pippo Inzaghi ended Liverpool's hopes of adding to their five European Cup triumphs, with Dirk Kuyt's 89th-minute header coming too late to save the Reds. "I think we controlled in the first half but not as much as we would have liked in the second half - but let's not forget that we were playing a top side with top players," said Gerrard. "Credit to AC Milan - they won and maybe they just about deserved it. "In the build-up to the game we said it would be decided on small details and a bit of luck and AC Milan got that. "We need to strengthen and bring some quality into the club. The manager and the people in charge of the club know that and it will be an interesting summer. "You've got to give credit to our lads, they gave everything and it just wasn't to be." Liverpool boss Rafael Benitez said his side paid the price for missing chances. "We played really well in the first half but conceded a goal through bad luck," said Benitez. "We were pushing and left a space and they have the quality to make the difference. We were trying to keep the ball but you need to take the chances." Benitez was also upset that the referee did not play out the full three minutes of injury time at the end of the match, but admitted that AC Milan were worthy winners. "It's not a reason, we lost against a good team with top-class players," he said. Liverpool defender Jamie Carragher was magnanimous in defeat, but admitted he blamed himself for giving the ball away in the lead-up to Milan's first goal. "I think the best team won," he said. "It was pretty even in the first half, but to give away a goal just before half-time was a killer blow. "I was in two minds as whether to control it or clear it but I should have done better."